Want to really make a great impression? Plan your wedding in Jamaica. Before your jaw hits the floor it is important to understand that Jamaica weddings are impressive, romantic, and free from many of the relatives and trappings that go into other weddings. More importantly, you will make her happy and everyone else you know insanely jealous. Better still, you will get to enjoy the wedding and the honeymoon in Jamaica in one fell swoop rather than paying the price of both. Who could ask for more and why on earth would you? There are many great things to enjoy while on holiday to Jamaica not the least of which is the music. You will hear popular songs transformed to a reggae beat. SThe music isn’t the only thing laid back about this little slice of paradise but it certainly sets the stage. Romantic getaways to Jamaica are quite common. If you’ve thought honeymoons to Jamaica were out of your price range, think again. You can find plenty of great cheap holidays and all inclusive packages to Jamaica that make the honeymoon of your dreams a very distinct possibility—even on a budget that is limited on its best days. If you want to save even more money, consider weddings in Jamaica. By taking the plunge and heading to Jamaica for your honeymoon, you can cut out the middleman (the big expensive church wedding) and enjoy two for very little more than the price of one. 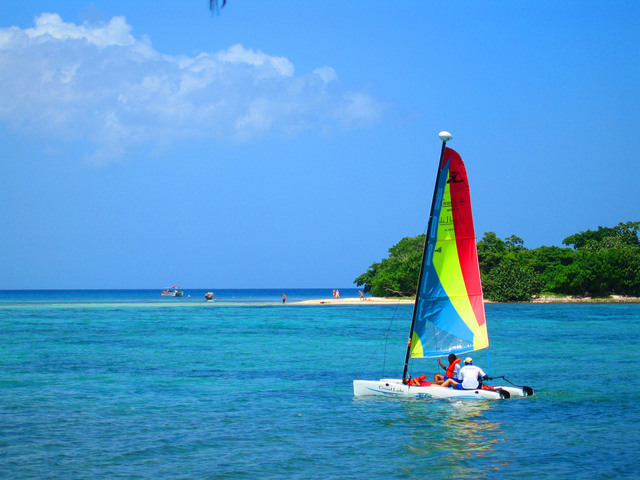 In fact, some of the all inclusive packages to Jamaica offer options for Jamaican weddings. Can you imagine a more stunning backdrop than the gorgeous waters of the Caribbean for your wedding photographs? hopping is a great deal of fun during holidays to Jamaica. Be sure you get those cheap holidays deals to Jamaica so that you have plenty left over to enjoy your shopping. There are also adventure tours, horseback tours, Quad tours, stunning scenery, waterfalls, and beaches to enjoy throughout Jamaica. Whether you are looking for a romantic escape for two or want something suitable for the entire family, Jamaica, as a holiday destination, delivers. Interesting places to visit include Nine Mile (the birthplace of Bob Marley), Black River tours, Kool Runnings Water Park, zip line tours, Aqua Sol Theme Park, and Dolphin Cover. Some resorts are designed specifically with family in minds and offer amenities that are suitable for small and older children. Before finding cheap holiday deals to Jamaica you should be aware that hurricane season takes place between May and November. During these months a hurricane is more likely than in other months. While it isn’t a probability that a hurricane will occur during the time of your holiday it is possible and something you should be aware of. To lessen the odds you may want to book your travels between December and April. You should also note that booking in those months doesn’t guarantee that there will not be a tropical storm or hurricane only that the likelihood is diminished. Make sure you have insurance protection for your holiday against weather either through your travel agency or that the hotel or resort you select offers it to all guests.